Looking back, pretty much every dress I packed for Japan was a midi hem length… and I ain’t mad about it. This dress was one of my very favorites from the trip! It’s so happy and colorful, don’t you think? Leave it it kate spade new york to create perfect-for-summer silhouettes in fabulously feminine color schemes, prints and embroidery. 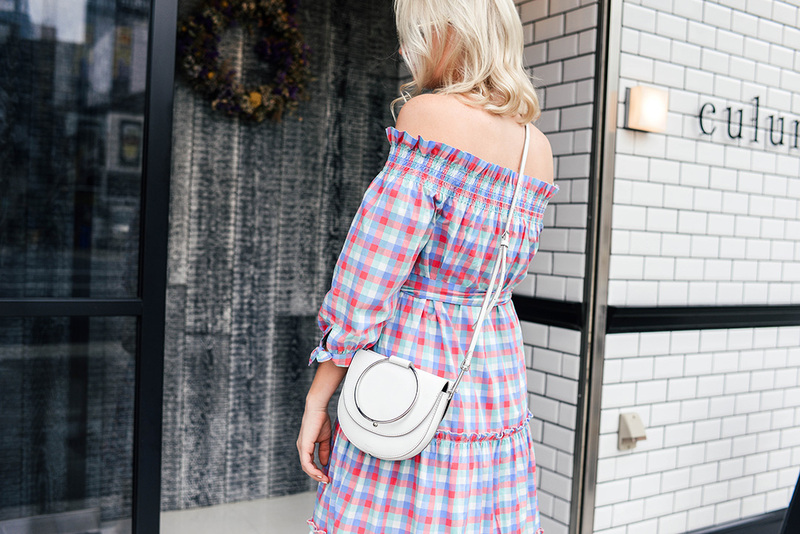 In addition to the girly gingham print on this dress, I love the ruffled details (you know me! ), and the belted waist for a flattering touch. I’m obsessed! Just the pop my summer wardrobe of whites needs. Madly in love with this $175 find. Truly such a great summer staple! This dress is giving me all the right How To Lose A Guy in Ten Days vibes! With seersucker, a sweetheart neckline and a bow to boot, this dress is the ultimate day-to-night darling. This A.L.C. cotton midi is casual, comfortable and effortlessly breezy! This white midi is under $50, for those of you looking for something budget-friendly! Loving this J.Crew look for an option for 4th of July! Speaking of the 4th, this one would also be a winner. Adore the ruffled neckline and smocked waist on this floral midi. So pretty! I’ll take any midi by Ulla Johnson… she just knows dresses! If you prefer flowy to form-fitting, try this new style. It’s under $170! You look marvelous! Everything at Kate Spade right now is so fun and carefree. Have you seen the pajamas? Adorable! Love all of these options! I am all about midi dresses!! This one is so cute! Omg I’m literally obsessed with your outfit. Gorgeous outfit you got there. Thanks for the idea dear!